Tired of winter guests? How about inviting some colorful visitors to your backyard who can entertain you instead. It could be time to turn that bit of grass and gravel, with its smattering of sheared shrubs, into a Sonoran Desert wildlife habitat. Sure, the birds and butterflies you attract will need a little food and shelter, but they're pretty low maintenance as guests go. Building a backyard habitat is not difficult or expensive. It can be planned over time, planting in spring and fall. The right native and desert-adapted plants and trees will provide a lush and colorful landscape in every season using very little water. You could have some of the basics already planted, and too much maintenance is actually discouraged. Consider the following guidelines to determine if a backyard habitat is right for you. Shelter: Diversity is key here. Migratory and native birds need high and low places to hide, to rest and to nest. They look for tall cactus, tall shrubs, and trees. Birds, including quail, and lizards, also like ground cover, so they look for vines, low shrubs and cactus in groupings where it is easy to hide from predators and find shade. This offers layers of protection for wildlife. Wildlife also needs open spaces in between groupings of plants to hunt for seeds and insects. Maintenance: An impeccable garden won’t attract much wildlife. Birds are attracted to insects under leaves and seeds shed by plants and trees. Don’t be eager to rake it up. Go easy on the pruning. Over pruning or shearing will remove flowers, seeds and berries that birds and butterflies are looking for on your plants and trees. A shrub sheared into a ball or triangle offers no lower branches to shelter birds or lizards. Visit your city’s demonstration garden to see how those shrubs should look so they keep wildlife coming into your yard. Use non-toxic methods to control pests and weeds. 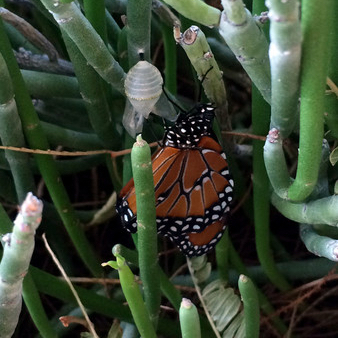 Plants: First the caterpillar then the butterfly. A butterfly garden needs plants that butterfly larvae can feed on and plants with flowers that provide nectar once a butterfly emerges. Desert milkweed, desert marigolds, and fairy dusters are common plants that offer both. Once mature, butterflies enjoy flame honeysuckle, several varieties of bird of paradise, and the desert willow. These same plants will attract hummingbirds along with the hardy aloe plant with its towering stalks of orange and yellow blossoms. Look for plants that flower and also offer berries and seeds. Here is AMWUA's guide to help plant a backyard where something attractive to wildlife is blooming every season of the year. The trickier part of creating a habitat is deciding how much time and money you want to spend on keeping fresh water, hummingbird food, and store-bought bird food in the backyard. You can opt to provide fresh water for bathing and feeding but it must be changed every two days to keep it from becoming a mosquito breeding area. Experiment with retail seeds, suet, and feeders to get an idea of the wider variety of birds you can attract. A sock filled with thistle seed can bring a colorful variety of birds into easy view. All-weather suet cakes attract large-billed birds, such as flickers and woodpeckers. Some seeds and suet can attract pigeons, which is why it’s best to buy in small quantities at first. Hummingbird feeders can be frustrating. The sugar water can attract more wildlife than you want, such as bees and ants, and the feeder must be cleaned frequently to keep it bacteria free and safe for the birds. 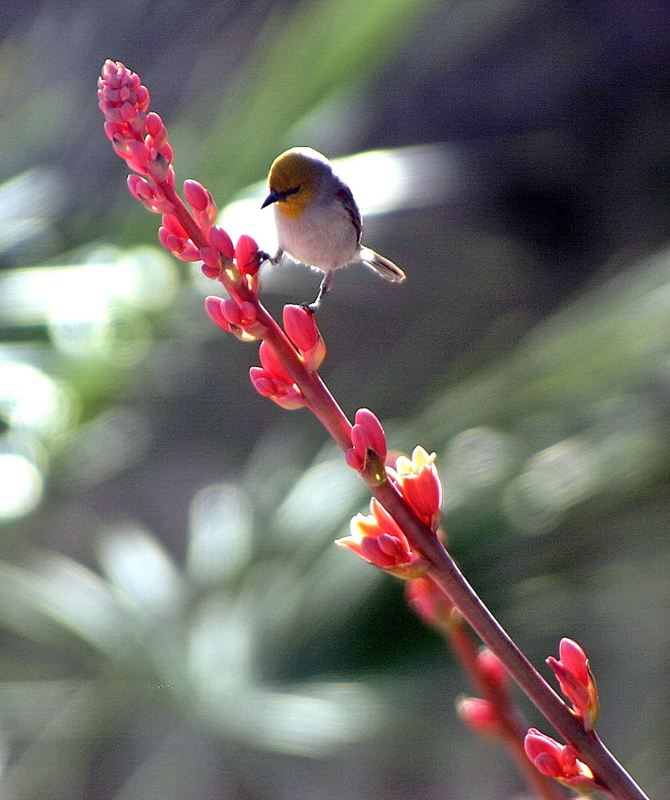 Many successful backyard wildlife sanctuaries rely solely on plants to attract hummingbirds. AMWUA and its member cities have classes, free handouts and advice about improving your backyard landscaping, saving water outdoors and turning your backyard into a bird and butterfly habitat. Contact your city’s water conservation office for help. Best of all, it’s a good time of year to plant. Hand those winter guests a couple of shovels.